Ally Packs and Villain Packs bring new depths to every Imperial Assault mission, whether you play a campaign that stretches across the galaxy or a tense, high-adrenaline skirmish. In every figure pack, you’ll find detailed plastic figures alongside new Deployment cards, Command cards, and Agenda cards. What’s more, these expansions also include new missions for your campaign and skirmishes! In our last preview, we explored potential strategies for Chewbacca and General Weiss. 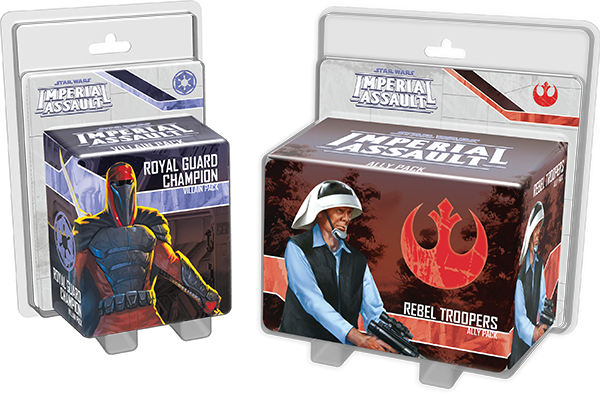 Today, however, we turn our attention to the Rebel Troopers Ally Pack and the Royal Guard Champion Villain Pack! The Rebel Alliance’s troopers form the bulk of its armed forces. They are daring individuals, willing to undertake even the most dangerous missions in hopes of overthrowing the Empire and restoring freedom to the galaxy. With the Rebel Troopers Ally Pack, you can bring these troopers to your games of Imperial Assault. 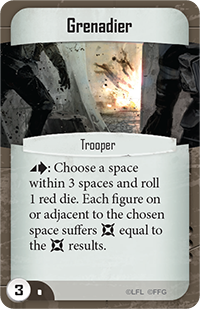 The normal version of the Rebel Trooper Deployment card was included in the Core Set, but the Rebel Troopers Ally Pack introduces the elite version of the Rebel Troopers, allowing you to muster more deadly combatants in your missions. For three extra points, elite Rebel Troopers offer a number of advantages: increased health, enhanced surge abilities, and a crucial new ability. All Rebel Troopers possess the Aim ability, which grants each figure an additional damage and increased accuracy if he has not yet exited his space during this activation. Because of this ability, Rebel Troopers are encouraged to take up a strong position and use their increased firepower and accuracy to hold the line and decimate the opposition. Now, elite Rebel Troopers offer the Get Into Position ability. For two actions, an elite Rebel Trooper can gain four movement points and become Focused, dramatically increasing their firepower. 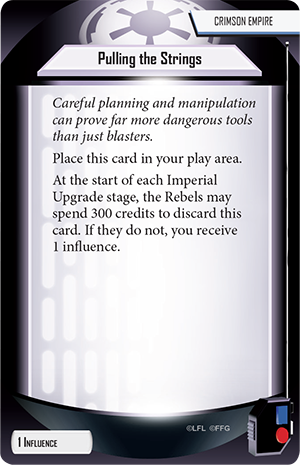 By spending your first turn using Get Into Position, you can set up devastating attacks from your Rebel Troopers on your next turn. In your campaigns, Rebel Troopers can prove to be effective allies for the heroes. The Aim ability gives them great potential for holding a position, which can buy the heroes time to complete their objectives. In the Brace for Impact side mission included in this Ally Pack, the heroes must download vital data before the Rebel Troopers are overrun by Stormtroopers. As your heroes rush past the Imperial forces, you can keep your Rebel Troopers in defensive positions, returning fire and forcing your opponent to expend vital actions to overcome your defenses. In the skirmish game, Rebel Troopers can easily form the backbone of your forces. 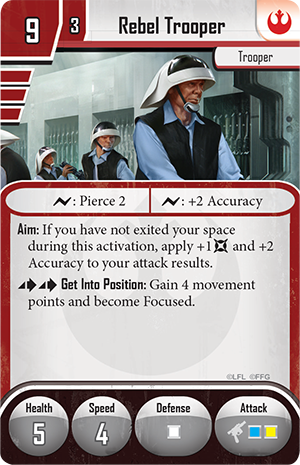 Get Into Position allows your elite Rebel Troopers to move and focus in the game’s first round, granting you more dangerous attacks as the first shots are fired in the second round. In addition, the new Command cards in this expansion help any army with Troopers gain the advantage. 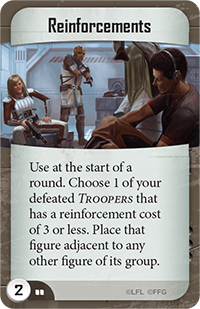 The Reinforcements card replaces a defeated Trooper on the board, forcing your opponent to work harder if he plans to claim victory points by destroying your figures. Grenadier , on the other hand, allows you to punish your opponent for clumping his figures together by making a single explosive attack. Finally, you may overwhelm your opponent with sheer numbers by using Strength in Numbers . 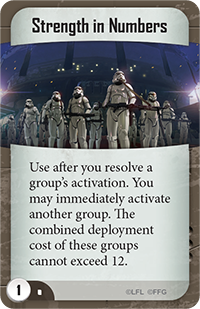 This Command card allows you to make two activations in a row, provided the combined deployment cost of the groups doesn’t exceed twelve points. Making two activations in a row can give you the perfect opportunity to sally forth from your barricades in a counterattack. As the leader of the Empire, Emperor Palpatine’s personal safety is entrusted to his Royal Guards – a chosen cadre of trained warriors. Yet even among these deadly elite, there are some renowned for their skill and brutality. The Royal Guard Champion is one such fighter. 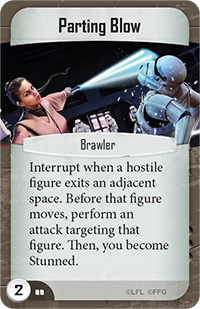 In your Imperial Assault missions, the Royal Guard Champion can cut a swath through hostile figures. His speed is great enough to quickly move across the battlefield, while his defense dice and high health ensure that his presence will not be quickly removed. The Royal Guard Champion’s surge abilities also support his aggressive approach, whether he pierces his opponents’ armor or leaves them bleeding in his wake. 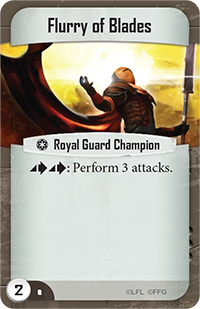 The Royal Guard Champion’s abilities focus on dealing the maximum possible amount of damage every round. Brutality allows the Royal Guard Champion to perform two attacks against different targets for just one action, giving him unparalleled offensive power. He can even attack on your opponent’s turn with the Executor ability. Once per round, when a friendly figure close to the Royal Guard Champion is defeated, he may move up to two spaces and perform an attack. Both of these abilities increase the raw number of attacks available to the Royal Guard Champion, solidifying his role as an offensive powerhouse. Your campaign missions can certainly benefit from the inclusion of the Royal Guard Champion. 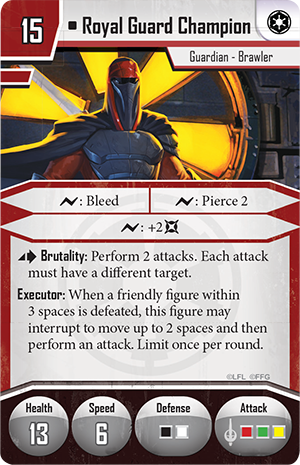 Many missions require you to wound all of the heroes to achieve victory and the Royal Guard Champion’s damage dealing potential is nearly unmatched among Imperial Assault figures. Of course, this Villain Pack also gives you access to the Crimson Empire agenda set. 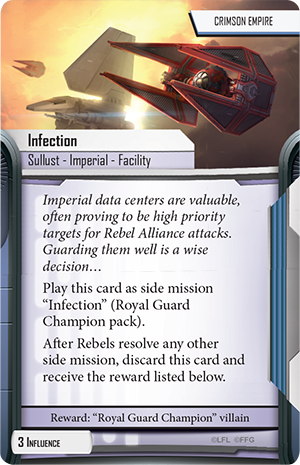 You may lure the Rebel heroes into a trap with the Infection side mission, increase the power of a Guardian group with Best of the Best , or steadily gather influence with Pulling the Strings . With these Agenda cards, you can put relentless pressure on the heroes both inside and outside campaign missions. In skirmish missions, a primary source of victory points is killing your opponent’s figures. The Royal Guard Champion truly excels at this objective – his abilities allow him to perform more attacks than most other figures, maximizing the amount of damage he deals each round. And with the Command cards in this Villain Pack, you can keep opponents from fleeing and give the Royal Guard Champion even more attacks. Parting Blow gives you the chance to interrupt and perform an attack when a hostile figure exits an adjacent space. After performing the attack, you become stunned, but you will undoubtedly punish a figure attempting to slip past you. Cunning enemies may attempt to engage the Royal Guard Champion at range, fleeing whenever he closes to attack. You can prevent this tactic with Cripple . 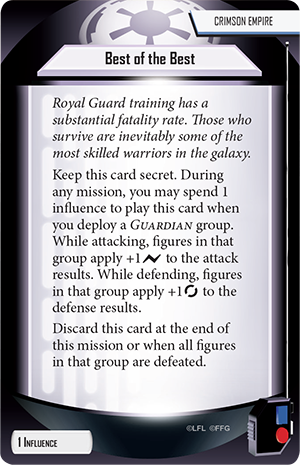 This Command card allows you to keep an adjacent hostile figure from leaving its space until the end of the round, keeping it within range of the Royal Guard Champion’s attacks. Flurry of Blades offers a final way to give the Royal Guard Champion more attacks. By spending two actions with this card, you can perform three attacks. What’s more, you can make all three of these attacks against the same target, which should be more than enough to finish off any figure. 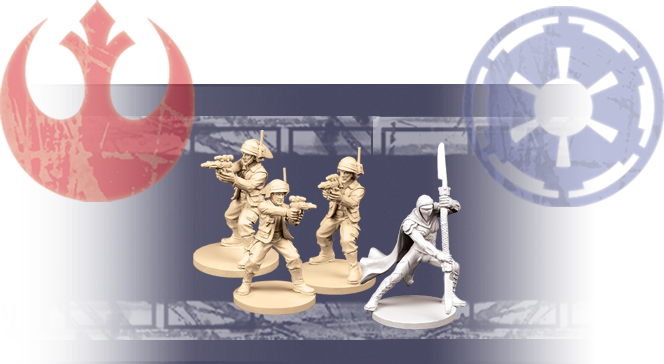 The Rebel Troopers and the Royal Guard Champion offer two very different styles of play. The Rebel Troopers excel at holding a position of strength, while the Royal Guard Champion moves among the enemy, wreaking havoc wherever he goes. 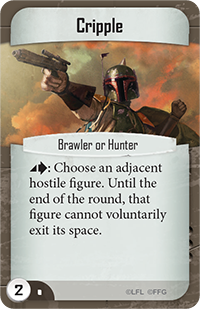 You can find these figures along with plenty of new missions and cards in Imperial Assault Ally Packs and Villain Packs. Pre-order your Imperial Assault figure packs at your local retailer today!